Hello everyone!! We are from Poland. We live in Bydgoszcz and we go to Primary School 28. This is our school! 1 Hello everyone!! We are from Poland. We live in Bydgoszcz and we go to Primary School 28. This is our school! 2 Hello! 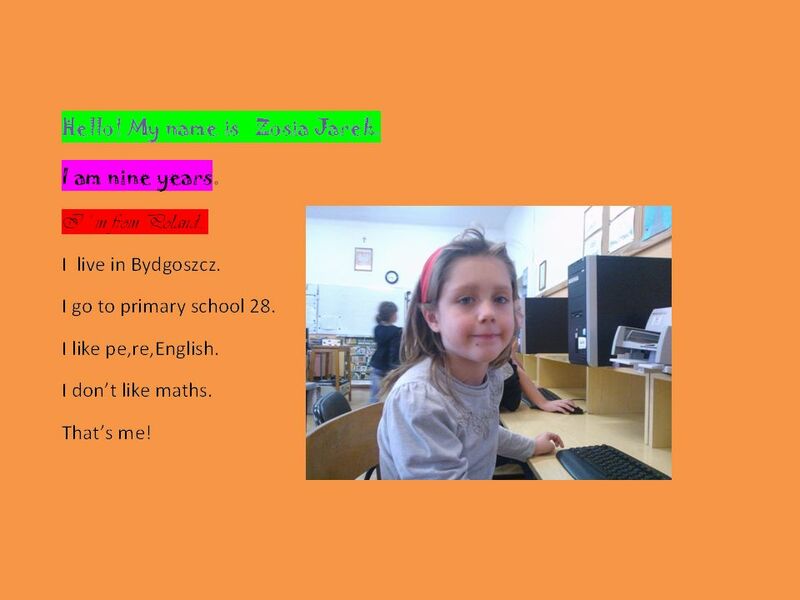 My name is Eva G ą sowska I am nine years old. I m from Poland. I live In Bydgoszcz. I go to Primary Schol nr 28. I like chocolate cake. I don t like salad with apple and carrot. 4 Hello! My name is Julia Jankowska. I am nine years old. I m from Poland. I live in Bydgoszcz. I go to primary school 28. I like Pe,Re, English. I don t like apples. That s me! 6 Hello! My name is Martyna Ruszkowska (on the left) Im from Poland. Im from Bydgoszcz. I go to primary school 28. Hello! My name is Weronika Noworol. (on the right) I am nine years old. Im ok. Im from Poland. I live in Bydgoszcz. I go to primary school 28. I like English. I dont like maths. 7 Helleo! My name is Olivia Lubowicz I am nine years old. I m from Poland. I live in Bydgoszcz. I go to Primary School 28. I like pe, english. I dont like maths. Thats me!!! 8 Hello! My name is Olivia Malinowska. J am nine years old. Jm from Poland. J live in Bydgoszcz. J go to Prinary school 28 J like Sport and HIP HOP dance. J dont like spinach. 9 Hello! My name is Tomek Bulawa I AM nine years old. Im from Poland. I live In Bydgoszcz I go to primary shool 28. I like chocolate. I dont like vegetables soup. Download ppt "Hello everyone!! We are from Poland. We live in Bydgoszcz and we go to Primary School 28. This is our school!" Pass the eraser. When the music stops – whoever has the eraser must finish the sentence…. SPEAK UP AND SPEAK CLEARLY! 2BM2U2 Food I like P1 -- H-h-h, h -h -h, h-h, hen. H-h-h, h -h -h, h-h, hand. The hen is in the hand. Hello, my name is Kacper and Im from Poland. Im eleven years old. I go to school numer nine in Łąka. Ive got brown eyes and dark hair. Kacper Nowok. In Poland. In Poland lessons usually start at 8.00 and end Children from 6 years old to 8 years old have general lessons. Student sometimes must. Welcome to our school ! A view from the school. The Adriatic sea and the school yard. That’s me My name is Fiona. I‘m 12 years old.. My hobbies I like playing handball, but I don’t like playing basketball. I like riding horses. I like riding. Naveen All About Me Malik 8/29/11. Naveen My name is Naveen Malik, I am thirteen years old. I was born on June 11 th 1998, National Hug Day, National.  As a part of Comenius Green Dishes project a few of our students gathered in „Ptasie Gniazdo” kindergarden. They were divided into three groups. Every. Bananas Apples Salad Grapes Chocolates Sweets Crisps Jam/sweet things. МБОУ « ООШ № 17» г.Анжеро-Судженск.  I like honey on my bread, I like salad, I like eggs. I drink water all day long. All these things make me strong.